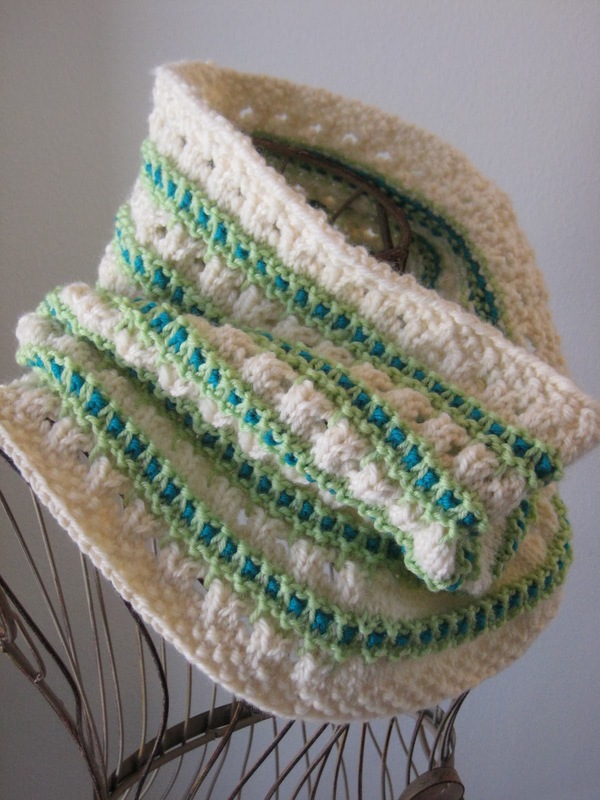 Using your size 4 circular needle and your color A yarn, cast on 116 stitches, place marker, and join in round. 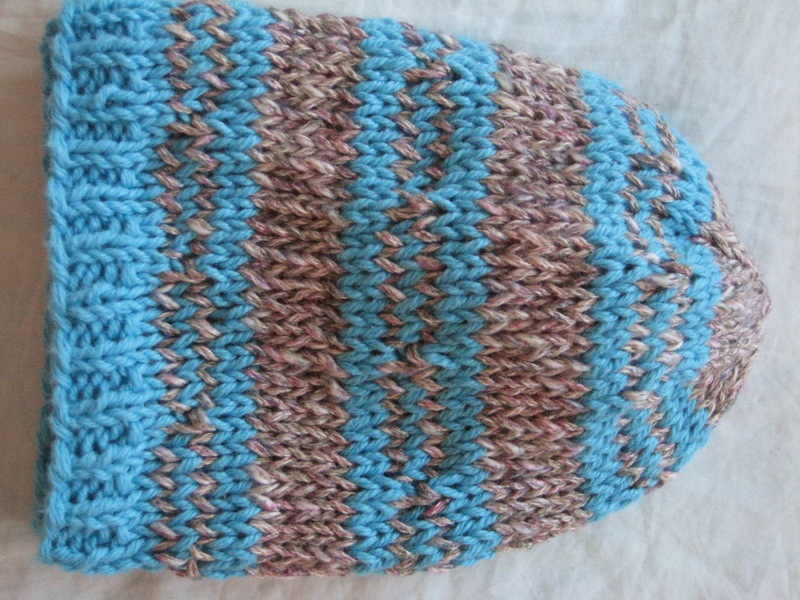 Knit 1.5" in a * k1, p1 * ribbing, and then switch to your size 7 needle and knit one row. Next, we'll begin the pattern, which is American Beauty Tweed from page 39 of Barbara G. Walker's A Second Treasury of Knitting Patterns, except adapted for the round. So here goes! 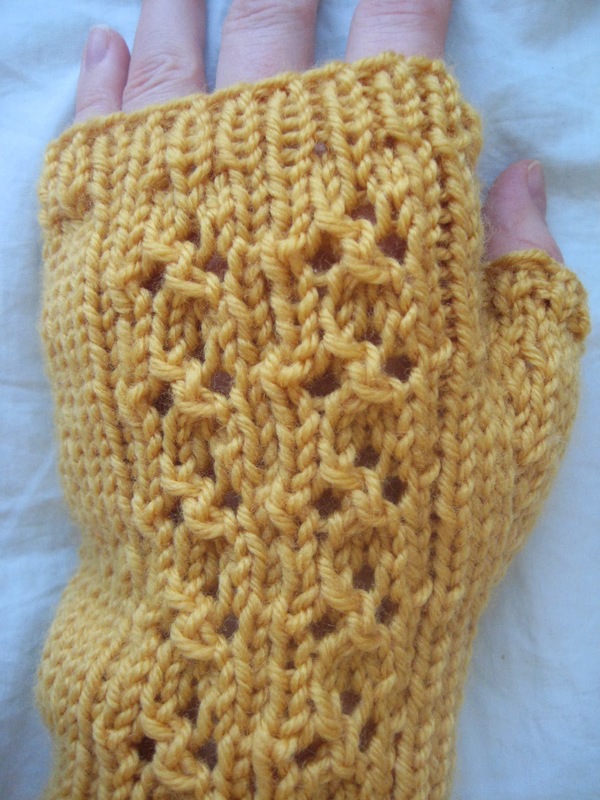 I recently received a lovely email suggesting that I make a pair of lacy, fingerless gloves. And I was immediately on board - I've been plotting fingerless gloves for a while now, other projects just keep getting in the way. Unfortunately, I didn't have any good yarn for a particularly lacy project, so I ended up with these kind of starter-lace gloves instead, which use a little bit of eyeletted ribbing, but are a fairly straightforward pattern. Now that I've patterned my first pair, however, expect to see more in the near future - and of a lacier variety! The pattern. A cloverleaf, if you look closely. 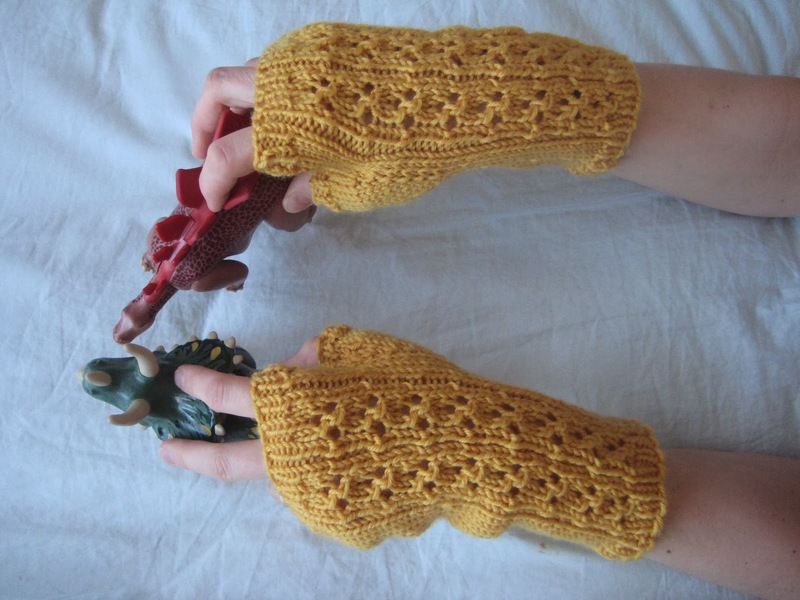 First and foremost: since these fingerless gloves have a pattern that's intended to be in different places on the two gloves (left of the thumb on the left side, right of the thumb on the right), we'll have to knit the right and left gloves with slightly different patterns. So let's begin with the left, and when that bad boy's done, we'll move on to the right! Okay, I know the name for this one is goofy. But the design reminds me of something between fine china and Sailor Moon, and I don't have a name for the stitch, so I got stuck. 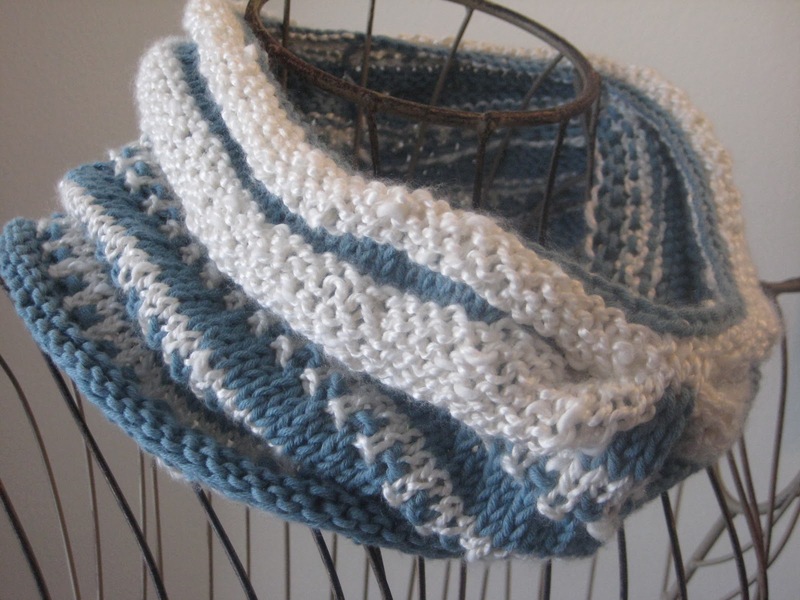 And, either way, it's a closer-fitting, quick-knitting cowl that gets a bit of a different look from the faux-bow gather of the front. As soon as I saw this yarn, I was in love. After all, it's ridiculously soft, delightful to knit, and a pretty pink color to boot (well, my four-year-old says it's "too pink", but he also thinks racquetball is called "rocketball," so I'm not giving him too much credit). 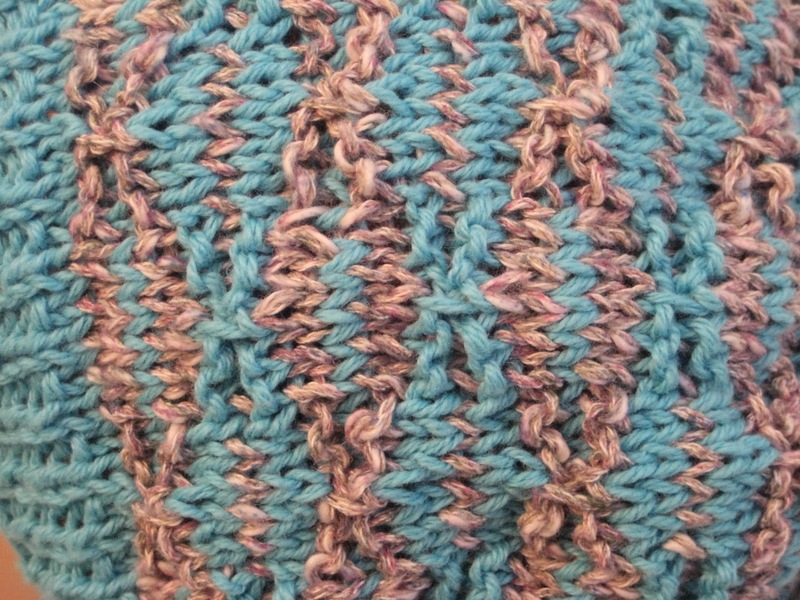 Anyway, the challenge I had after buying this yarn was finding a decent way to knit it up. 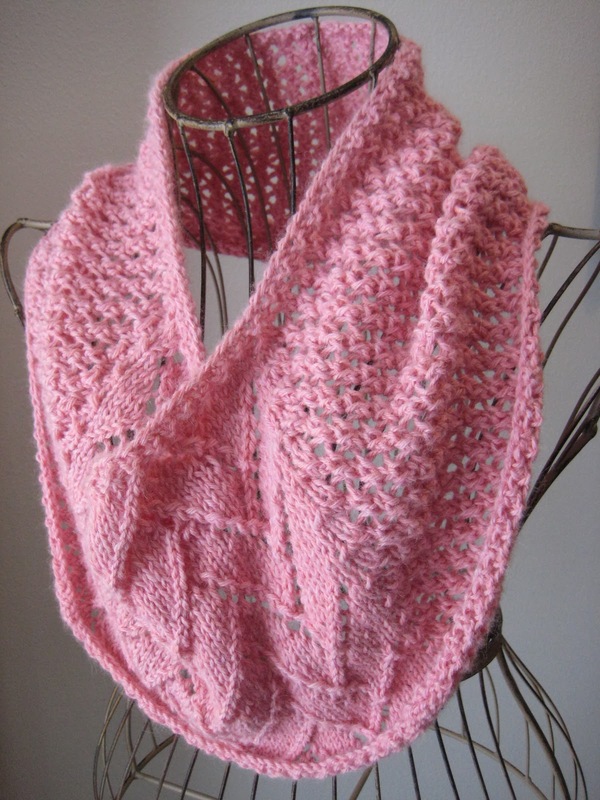 And after rejecting not one, but TWO two-color designs and ripping out false starts at least four times, I came up with this voluminous and luxuriously soft spring knit, that could also be made a few inches shorter if you wanted something with a little less bulk around the neck. But let's get on to the pattern, eh? Cast on 119 stitches, place marker, and join in round. Then, knit one row in a * k1, p1 * pattern, placing one marker after you've worked 37 stitches, and the next marker 45 stitches later (so this marker should be 37 stitches from the end of the round) (and yes, since you're knitting a * k1, p1 * pattern, you will have two knit stitches together on either side of the round marker, since we have an odd number of stitches). Purl one row, and then complete another * k1, p1 * row like the first, slipping extra markers when you come to them on both rows. 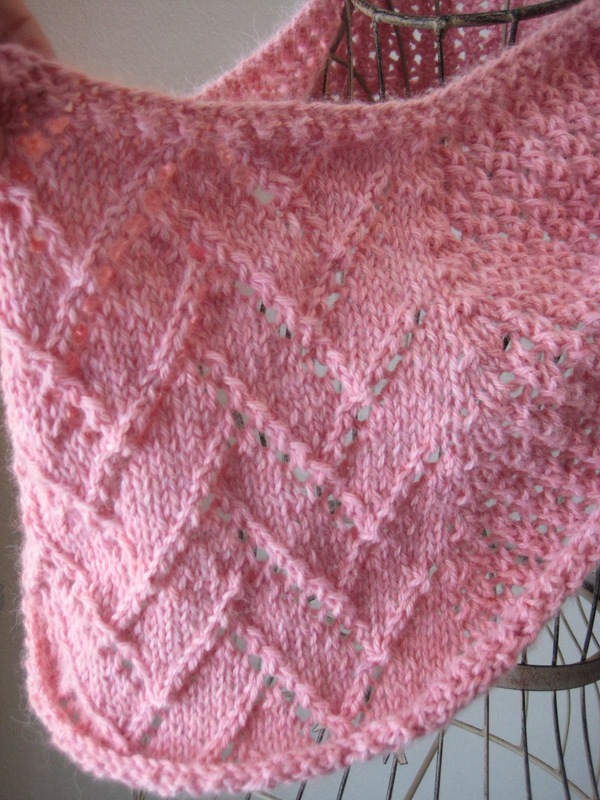 Then we'll go straight to the pattern, which is a combination of Flemish Block Lace from page 270 of Barbara G. Walker's A Second Treasury of Knitting Patterns and a simple lace pattern. So let's get started! 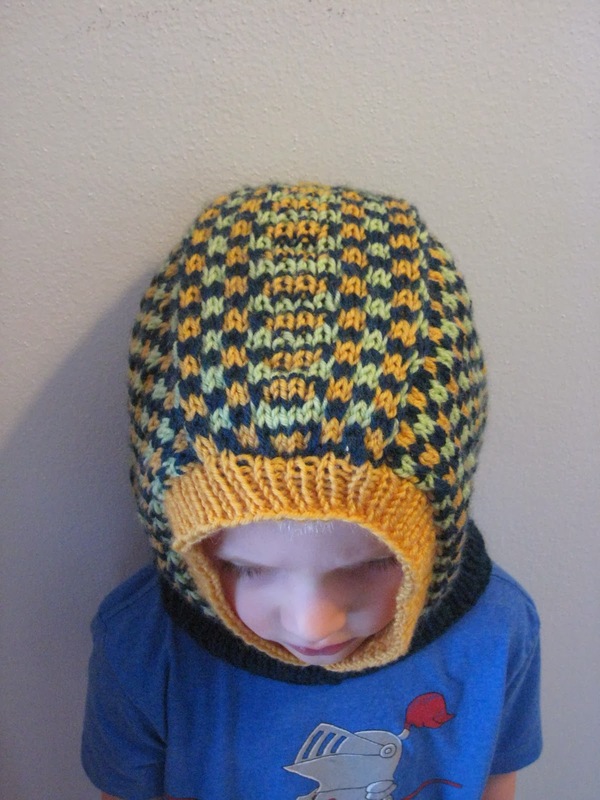 So I'll be honest; I'm not sure I would have ever come up with the idea to knit a kids' balaclava on my own. But after a special request for a simple but attractive kids' piece, I came up with this design. 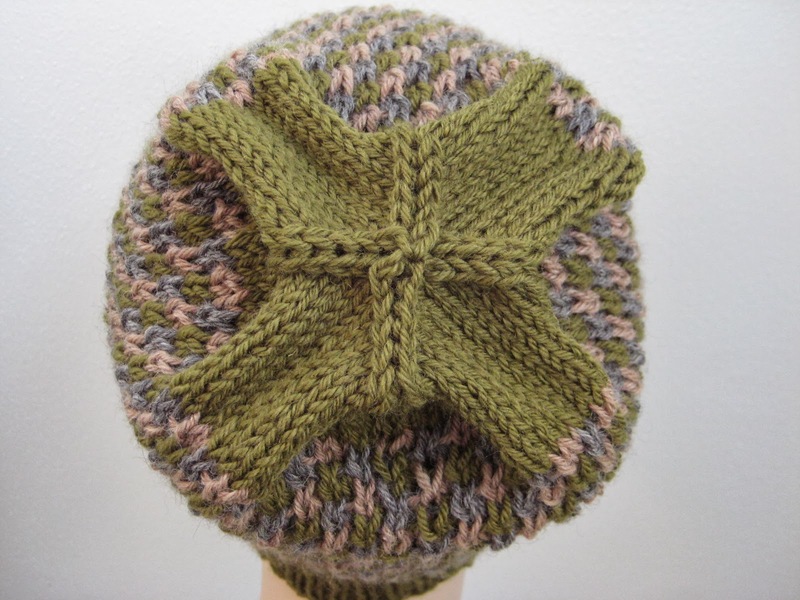 And while it's not quite as "simple" as I originally intended, I do think that the three-color pattern I've come up with is striking, and easier to make than it looks, since the most complex thing you'll need to know how to do to make it is pick up stitches. However, as this pattern has more instructions than many of the ones I post, I highly recommend reading through it before you begin, so you know where you're going. The top. With racing stripe. Before we get to the pattern, let me outline how the thing is constructed. 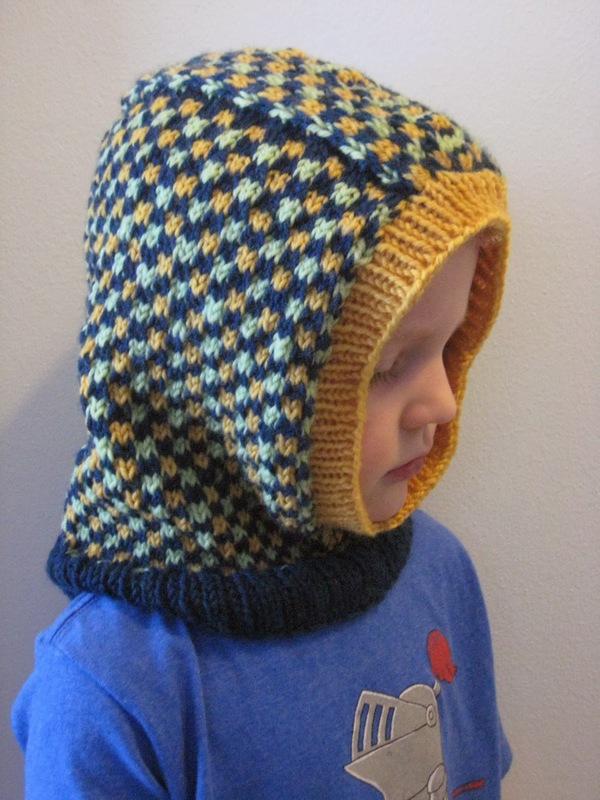 First, then, we'll knit a strip which will end up being the top of the head, and then we'll pick up stitches along both sides of the strip, to create the sides and back of the hood. 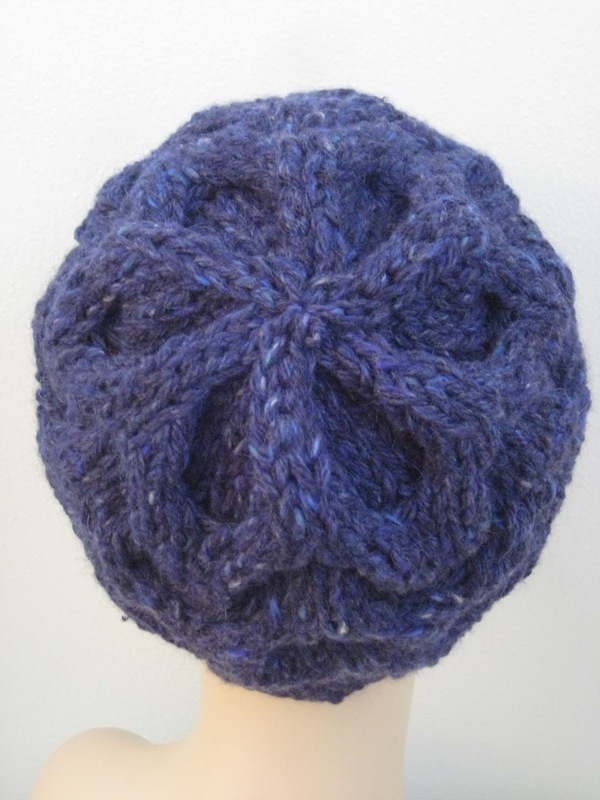 Next, once we've knit the entire head-covering part, we'll join the thing in a round and knit the neck portion. Lastly, we'll pick up stitches around the face hole to create a ribbing. And now that we know where we're going with this thing, let's get started! So here's the deal; I was so inspired by the yarn-mixing of my Little Bowknot Hat that I finally allowed myself to buy another one of the loner skeins of clearance yarn I've been dying for (in this case, the Berroco Versa, which is a light chunky-weight cotton acrylic blend that comes in sort of a knit tube, if you're looking for something similar). And I have to admit that I've very pleased with the results of this pattern, especially considering how little yarn I used, and how fun it was to knit. 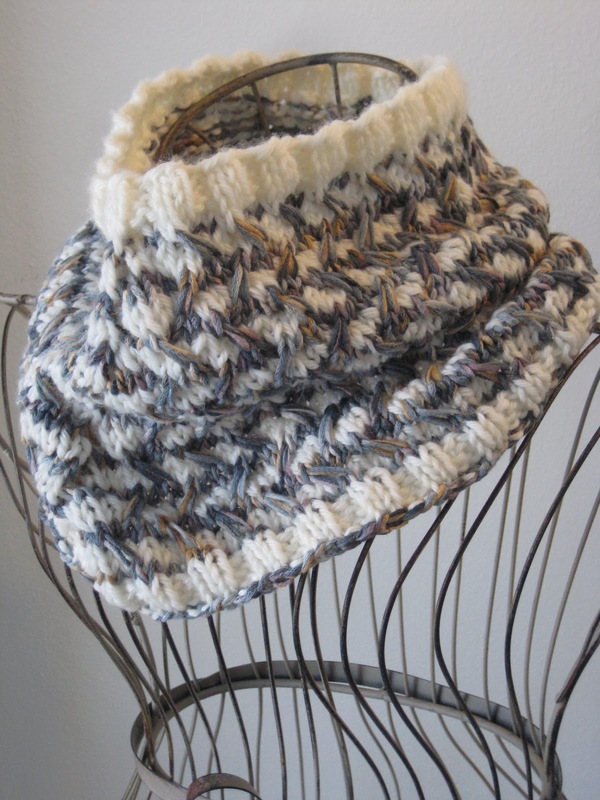 Worked with an asymmetrical line of eyelets, then, the Diagonal Weave Cowl is a great opportunity to combine a couple of stash skeins into a striking project. 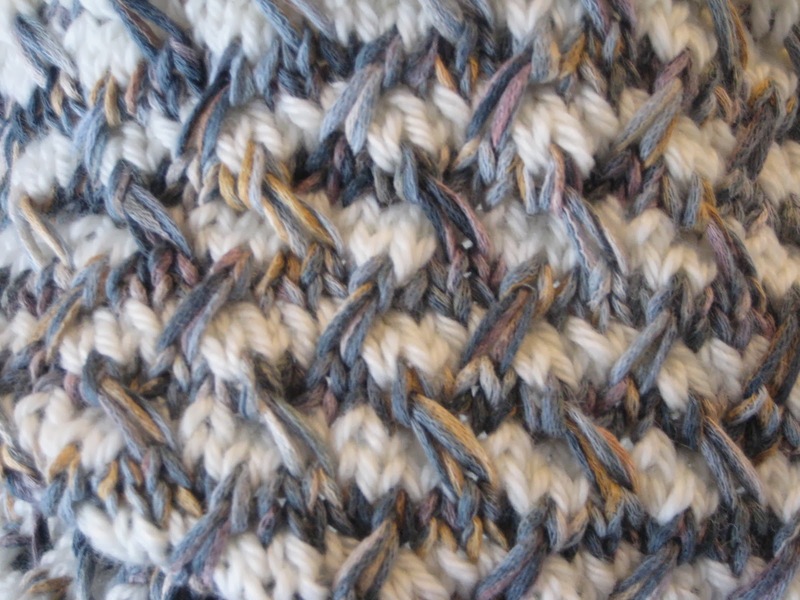 A close-up of the weave pattern itself. So let's do this! 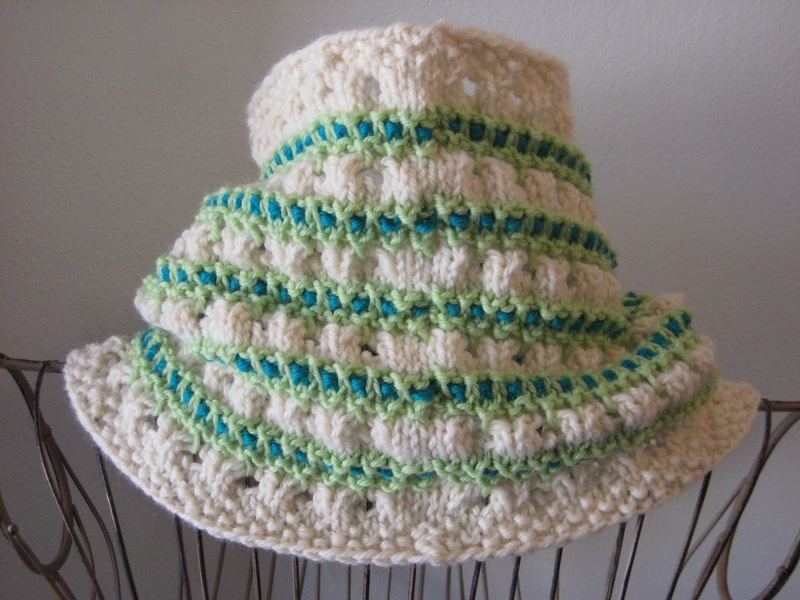 Using color A (for us, the cream) and your size 8 circular needle, cast on 100 stitches, place marker, and join in round. Knit 3 rows in a k2, p2 ribbing, placing your additional stitch marker after you've worked 49 stitches. Slip marker when you come to it during your ribbing rows, and transfer piece to your size 10 needle when you're finished with this. 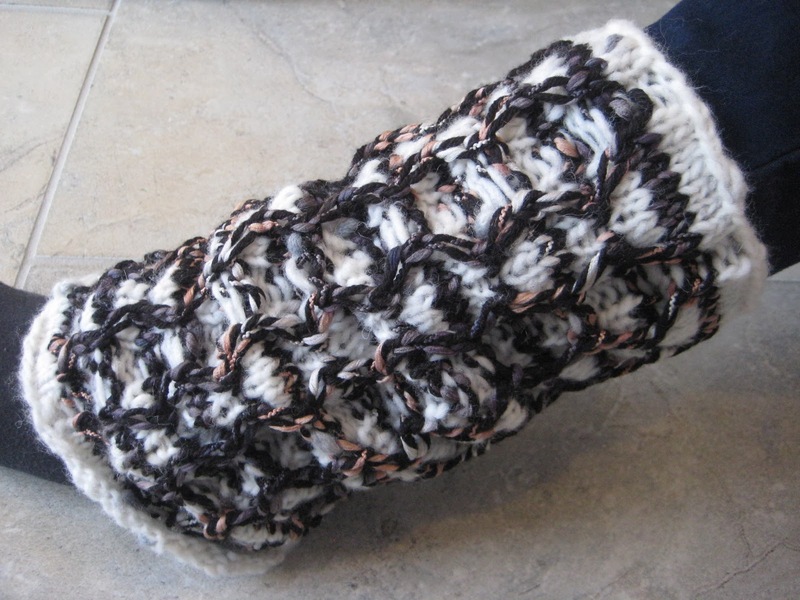 Knit one row around, still slipping extra marker when you come to it. 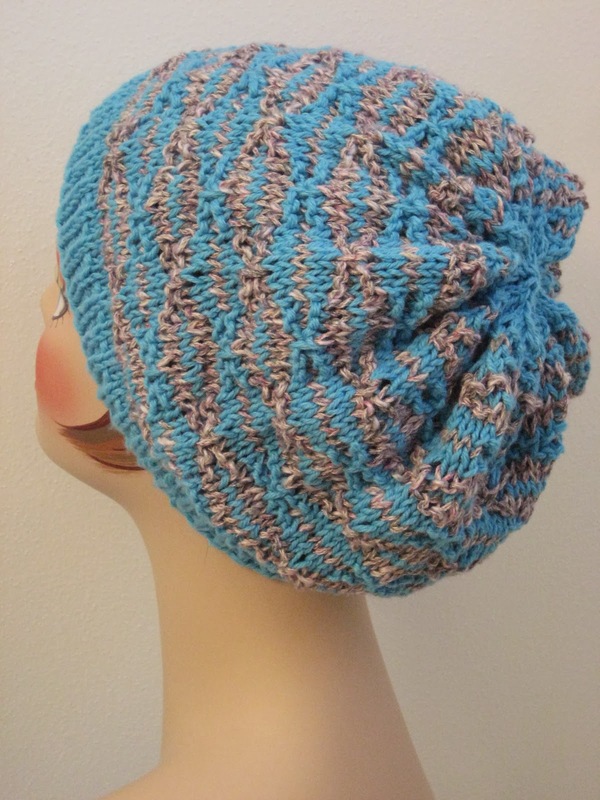 Why did I name this hat the Blue Ice Beanie? Well, definitely not because I was inspired by one of the singles off of indie pop group Shout Out Louds' 2013 release. 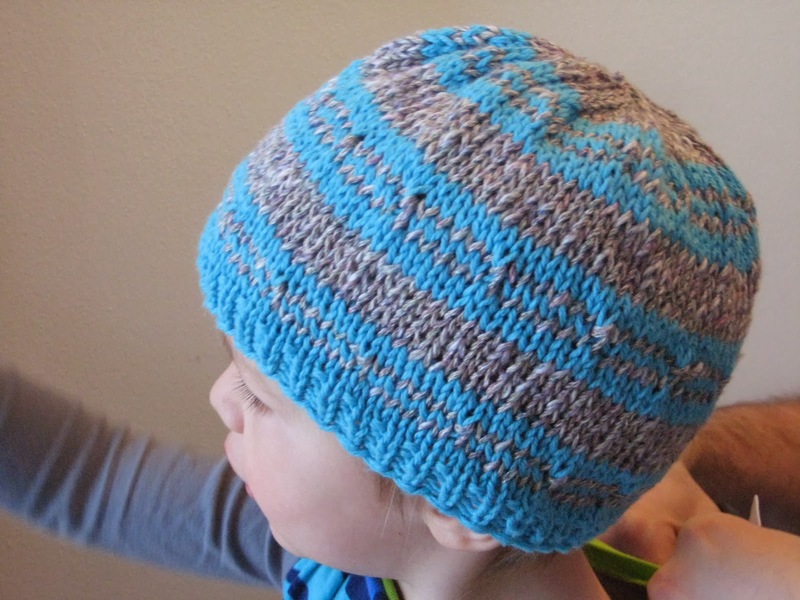 Whatever I named it for, however, I knit the toddler version of this hat with the yarn I had left over from the Little Bowknot Hat, and it's another medium-weight, springy hat. 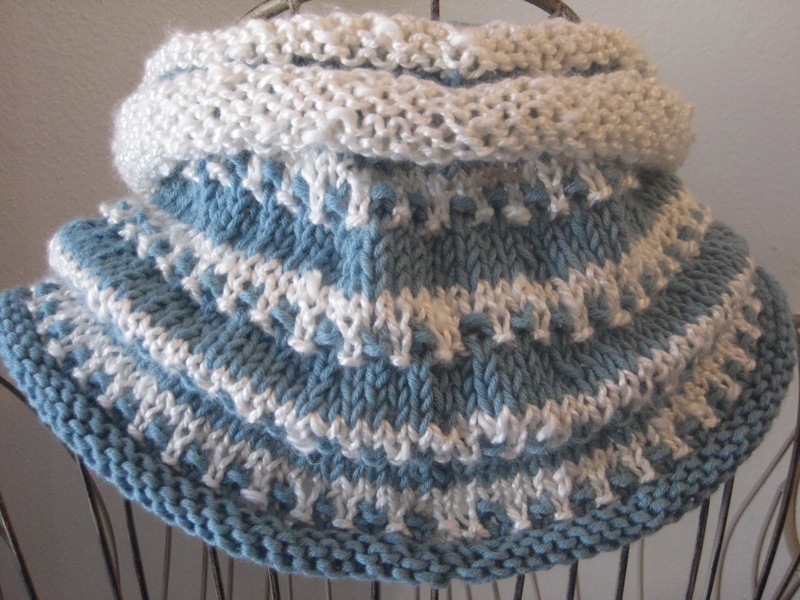 I also recommend that you knit it on smaller needles than I did if you've got a one-year-old in mind (I knit the toddler version on size 7s, and you could probably go down to size 4 - 5 for a 1-year-old, gauging down your ribbed band as well). Anyway, let's get started! A clearer picture of the pattern. Ordinarily, I tend to think that my yarns need to match in any given project; I'm much less likely to pick up two completely different skeins in different colors than I am to get two different shades of the exact same yarn. 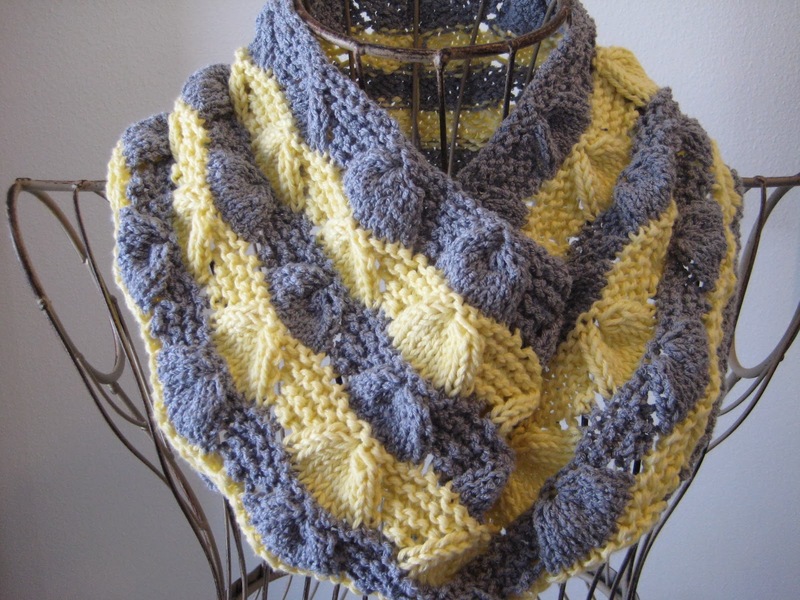 When I saw the gray-ish yarn that I used in this pattern, however, there was only one skein left, and it was on closeout so I knew there would never be more. 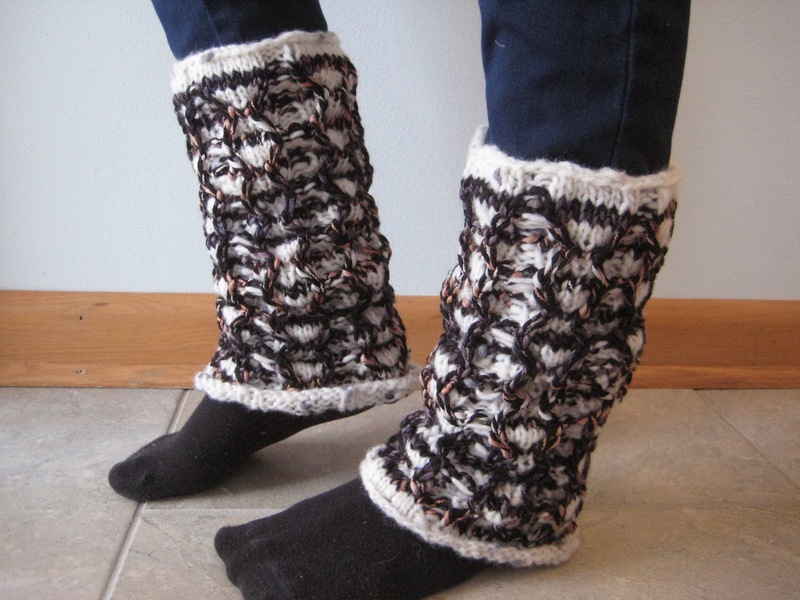 So I decided to go out on a limb and knit it with a completely different yarn. 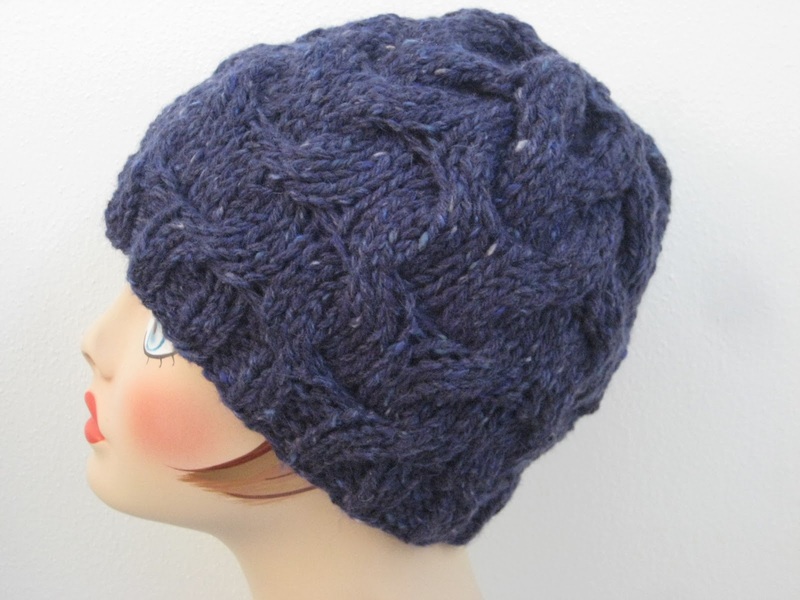 And luckily, the ropiness of the gray yarn and the softness of the blue created even more texture in this mid-weight, springtime hat, and I ended up loving the results. Or in other words, this is a perfect pattern for a couple of skeins of dk-weight stash yarn that you've never quite figured out what to do with before. The little bowknots, close up. Using color A and your size 5 circular needle, cast on 110 stitches loosely, place marker, and join in round. 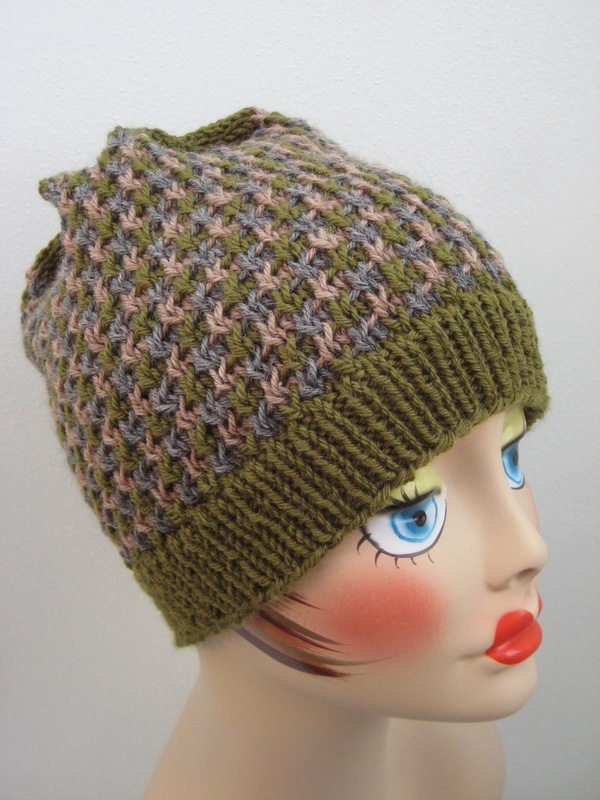 Knit 1 inch in a k1, p1 ribbing, and then switch to your size 7 needle and knit one row around. 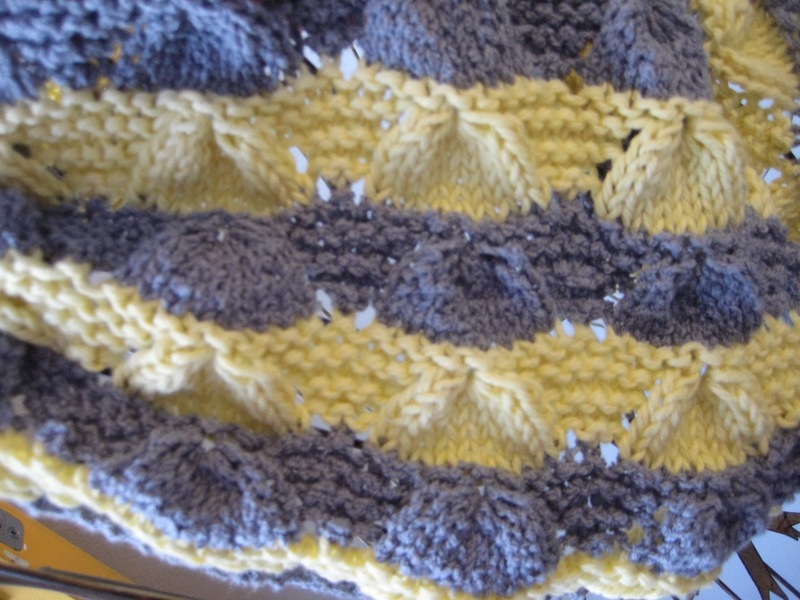 Switch to color B, and knit one more row around. And now that these rows are complete, let's move on to the main pattern, which is a small, two-color adaptation of Bowknot Stitch from page 133 of Barbara G. Walker's A Treasury of Knitting Patterns. So let's get started!